It's the only explanation for why I'm covered in it. Even better is that the washer is in the hallway for the duration. I'll preserve my dignity and NOT post the photographic evidence for all the internets to see . . . Yesterday we got the hardibacker down. One of the many instances in which this is not a how-to guide. There's no way our pine floors meet the deflection guidelines, and there's no thinset that permits using tongue and groove as a base. 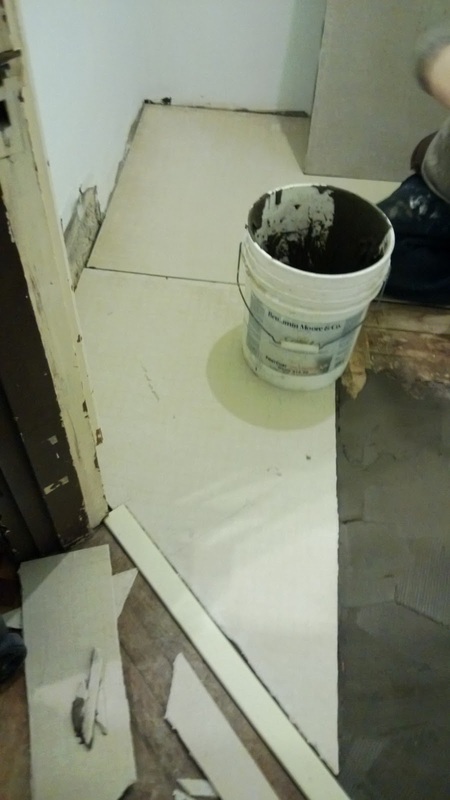 Since there was no way I was ripping out our original floor and installing plywood to do this (or building up the floor), we went ahead and did the best we could. I've had success doing it this way before, so I'm confident it'll be fine. Things would be different if this were a high traffic or wet area, or if we weren't using hex tile that's small enough not to crack over the imperfect base. In other news, TILE - despite how lovely it looked in the box, this tile is my new mortal enemy (because tiling was my secret superpower, along with loading uhauls and eyeballing center and level). 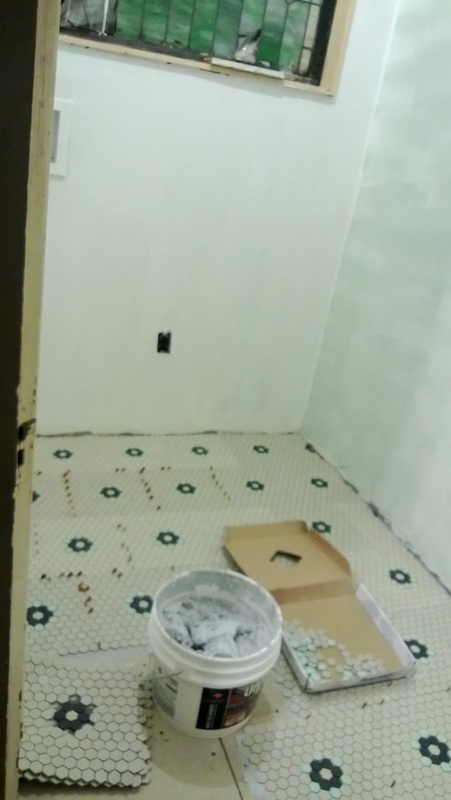 Many of the tiles (Home Depot's Merola antique black and white hex flower in unglazed porcelain) were mislaid on the sheets, causing them to not line up right - which I didn't notice till after the first row was laid. 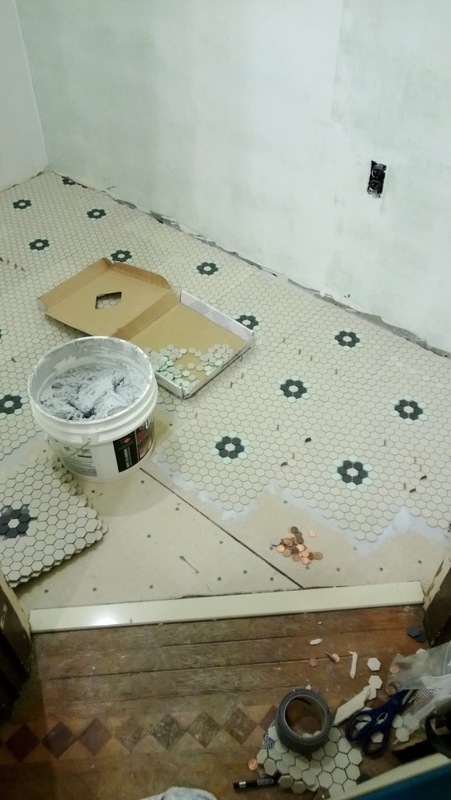 Tearing that out, cleaning up the tiles and thinset, and figuring out the problem took up more of my energy than it should of, so the job didn't quite get done tonight. And I'm not even going to go into the fact that the sheets vary in color even though they're all the same batch number . 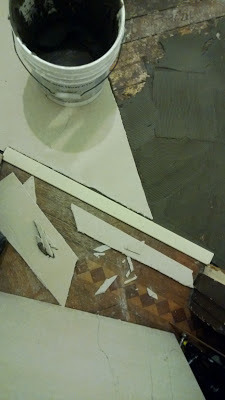 . .
What you can't see in the photo are the green tiles that surround each of the dark flowers - that was just a separate sheet of tiles that was cut apart, and we popped the white tiles out and substituted the green. Initially we were going to do a more complex pattern - but there's more than enough color going into the room. 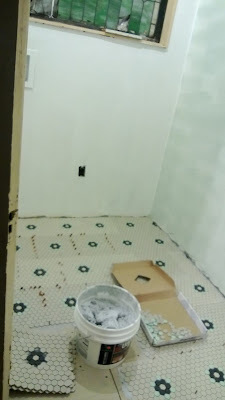 Tiling will get finished tomorrow, and I may start grouting, not sure yet.